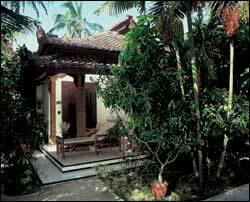 Located on Mendire Beach, Candi Beach Cottage is set amidst swaying palm trees. 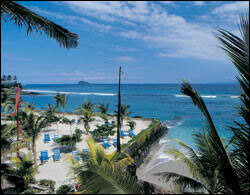 Gentle sea breezes provide a welcome oasis for enjoying scenic views of neighboring islands. Candidasa, the Ten Temples, retires to numerous hillside shrines overlooking the beautiful coast of East Bali. Enjoy this peaceful setting at the Candi Beach Cottage. Our friendly staff will make your holiday relaxing and memorable. Attractively decorated cottages and rooms at the Candi Beach Cottage are surrounded by beautiful gardens. All rooms are fully air-conditioned for complete comfort and are provided with private bathroom, hot water, mini bar, music, telephone, colour TV with in house movies and private terrace. The open-air restaurant is the perfect place to enjoy the view while feasting on savory Oriental and Continental cuisine. The bar offers refreshing tropical drinks in a comfortable and relaxing atmosphere. Spend peaceful days in the pool or spa. Water-sports equipment, a fitness center and tennis court are available for sports enthusiasts. Spend peaceful days in the pool or spa at the Candi Beach Cottage. Water sport equipment, Fitness centre and Tennis court are available for sports enthusiasts.